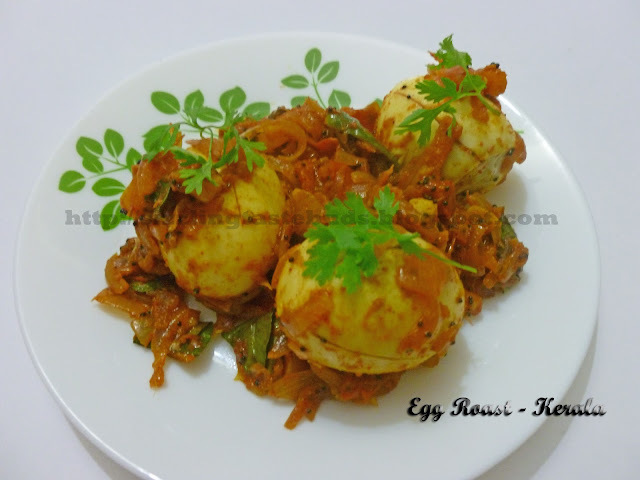 Egg Roast is the most popular South Indian dish. Its simple, easy, spicy, bit tangy, awesome dish from Kerala. Found it really interesting and simple, so gave it a try and it was worth a try. So here's the simple Egg Roast recipe from God's Own Country, KERALA. 1. Boil eggs, remove the outer shells and make some slits on the eggs making sure not to cut the eggs into halves. Keep aside. 2. Heat 1 tbsp oil in a wok and add mustard seeds. Once these starts crackling, add curry leaves and chopped garlic. Fry for a minute. 3. Add sliced onions and fry till they turn slightly brown in colour. 4. Add Ginger - garlic paste and slit green chillies. Saute it for a minute. 5. Now drop chopped tomatoes and cook till tomatoes become soft. 6. Add in all the dry masala's (haldi, red chilli powder, garam masala powder, dhania powder) and salt. Fry it for 2-3 mins. 7. Drop in the slit eggs and coat it with this masala and cook for a minute. 8. Adding soya sauce and hot and sweet tomato ketchup enhances the taste of this egg roast dish. This step is optional but i recommend this as I tried this myself and would never miss this step. 9. Garnish with chopped coriander leaves and serve hot. Kerala Special Egg Roast is ready to be served.